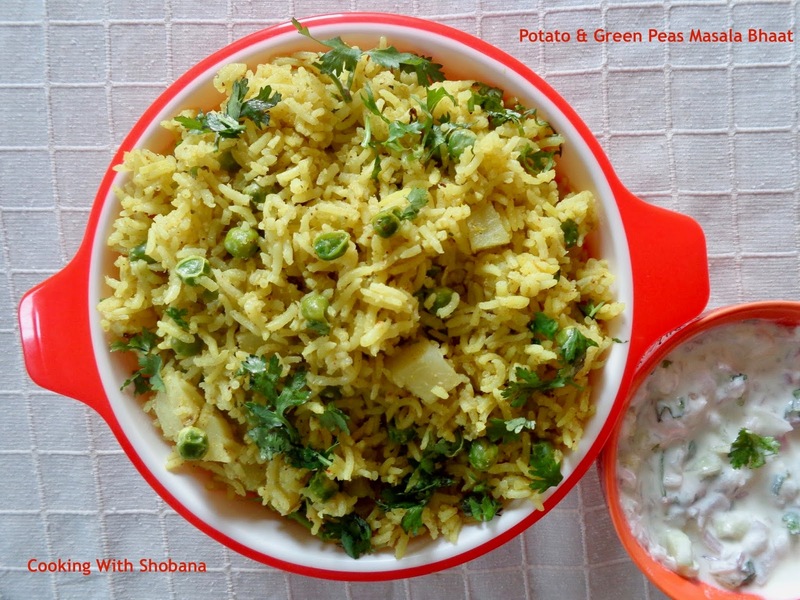 When you are pressed for time and want to rustle up a quick meal, one option is for you to make masala bhaat using basmati rice, potatoes and green peas. Make a raita or salad as accompaniment and you are ready to go! I made this the other day when I was rushed for time and it turned out to be quite delicious! I used frozen peas for convenience. This recipe has been adapted from Potatoes & Green Peas Masala Bhaat by Tarlaji Dalal. In a small mixer jar, grind together fresh coconut gratings, chopped ginger, chopped green chillies and garlic cloves to a smooth paste/masala using very little water. Cover and cook on medium flame, stirring occasionally, for 12-15 minutes or till all the water evaporates. Stir the rice gently so that the rice grains don't break and that the rice gets cooked evenly.